Training: UN Mechanisme Part 2 (A). Saturday, 30 March 2013. ICCPR mechanism and individual complaints, but Ashley one of the trainer of this program preferred to call it "communication" rather than "complaints". conducting UN Mechanism, ICCPR training. 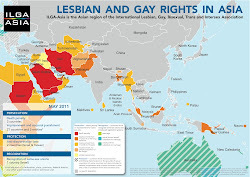 State Report Concerning on The Rights of LGBTI 2013. Azusa added her experiences the reporting mechanism. Group picture after session ended.